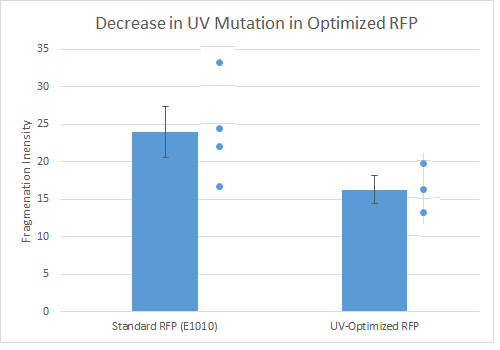 Overall, our optimization algorithim was able to reduce the UV-mutagenicity score by 34% relative to the original E1010 sequence. 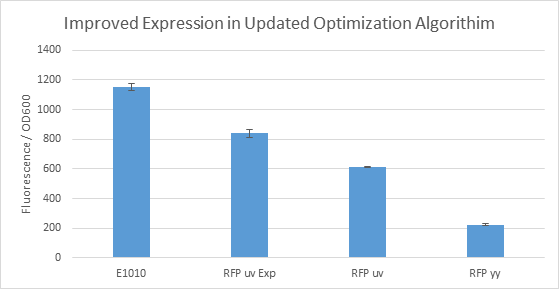 This degree of optimization is virtually identical to K1673101, despite the sequence changes made to improve expression. As shown on this graph for data using K1673010, which has only a 12% reduction in UV-mutagenicity score, there is a clearly detectable decrease in the rate of pyrimidine dimer formation following UV irradiation. We first check for the successful integration of our synthesized sequence for K1673102 first by restriction digest. A band was produced at 2.8 kb, as expected for the sequence in pSB1C3. We then sequenced the gene from the forward and reverse ends using VF2 and VR primers. This sequencing conclusively determined that our optimized sequence was present and in the correct orientation. Although both K1673101 and K1673102 had codon-usage frequencies factored in during the algorithmic optimization process, the method used for optimizing K1673102 was greatly improved with new rules for accounting for codon expression differences. In particular, emphasis was placed on "rate-limiting" codons, that is, codons with especially low abundance, as opposed to general CAI scores (table of codon usage frequencies provided by GenScript). 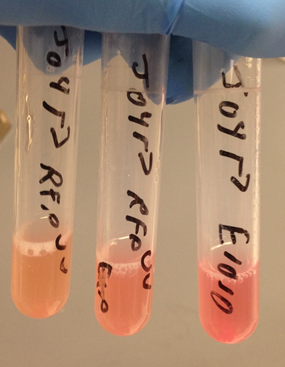 When placed under the R0010 IPTG-inducble promoter, our cells visibly fluoresced red. To check that our mutation-optimization procedure did not disrupt expression compared to the codon-optimized sequence, we measured fluorescence intensity at 645 nm with multiple replicates. As shown on the graph below, K1673102 (labeled as RFP uv exp) has about 80% as intense expression as E1010.